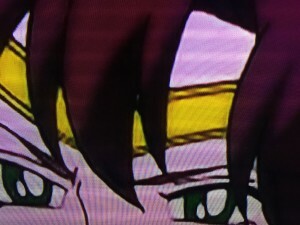 Episode 96, Coldhearted Uranus: Makoto in Danger, has Makoto infatuated with Haruka. 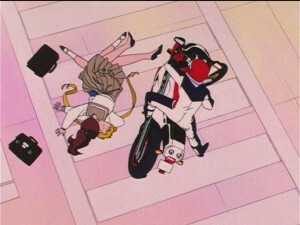 Makoto and Usagi are walking across the street on the appropriate crosswalk when Haruka flies in on her motorcycle. In her usual protective ways Makoto dives on Usagi to protect her, injuring her hand in the process. It’s clear here that Haruka has committed a traffic violation of some kind as she stops right in the middle of the pedestrian cross walk. What if this had been a child crossing the street? Or Luna who seems to spend a great deal of time in the middle of the road? Makoto is totally crushing on Haruka as she gets involved in a complicated scarf returning situation with her. The attraction is not in the slightest bit subtle. 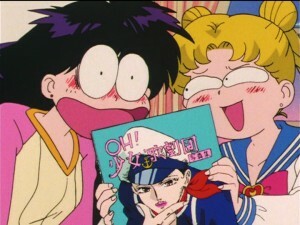 Usagi and her friends are concerned with this as Makoto gets targeted by this week’s Daimon and in doing so somehow gets Haruka’s attention. 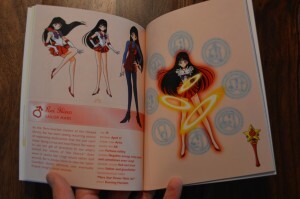 Another joke is thrown in here about Rei having a magazine with a lady with a moustache on the cover. It’s called “All Girl Review Picture Album”. I can’t say I really understood what this reference was actually about back in the day but I believe it is something similar to the all female actor troupes like those appearing in the latest Sailor Moon musicals. Makoto eventually explains her fascination with Haruka as being a sort of admiration, but it’s a bit hard to ignore the lesbian attraction that is fairly clearly demonstrated in this episode. This season has a lot of that. 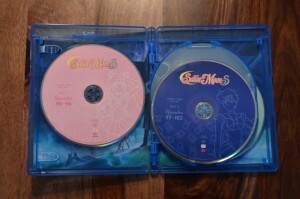 At one point the issue of the young Haruka driving is addressed. Haruka explains that she got her license abroad, but this appears to be a complete lie. 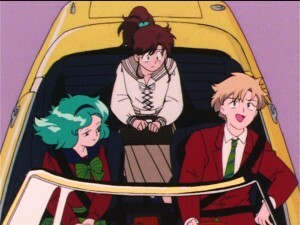 The answer, it seems, is that Haruka is driving illegally. 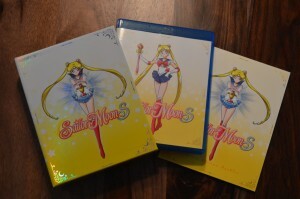 The latest two episodes of Sailor Moon S are now available on Hulu and Neon Alley. This week two of the Sailor Guardians are targeted as first Makoto and then Ami have their Pure Hearts stolen by the Death Busters. Episode 97, The Labyrinth of Water: Ami Targeted, is of course all about Ami. She spends a lot of time swimming yet it’s her friends that get the flack for her ignoring her studies! A jerk teacher tells her that she needs to spend less time hanging around reprobates like her friends. 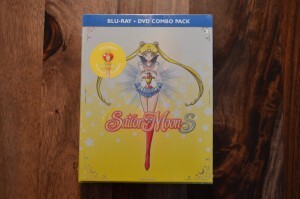 We can only assume this mostly means Usagi and it’s really just Usagi and Minako that are terrible at school. Rei attends a fancy school which we know next to nothing about and we don’t really know how Makoto’s grades fare despite her living alone and supporting herself mysteriously. 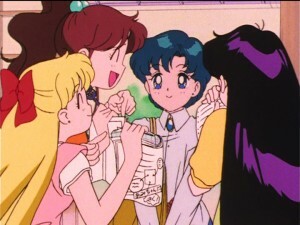 Usagi thinks that the best thing for Ami is for her to be isolated from her friends so that she can concentrate on her studies. This is a bit silly of course as she could have simply left the country to concentrate on her studies during the last season but chose not to. Ami swims a lot. Then she races Michiru, who is upset she didn’t give it her all. 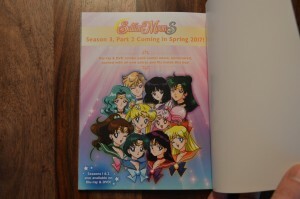 This is funny when we learn in SailorStars that Haruka always paces herself when Michiru runs. On a rematch they both go all out which Ami finds satisfying. 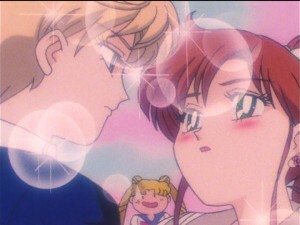 A semi joking scene at the end of this episode insinuates that Ami is attracted to Mamoru. Does anyone ship these two? They hardly have the well established relationship that Mamoru and Rei share.